Depression and Alcoholism are inextricably linked. We feel bad, down and generally not good about ourselves - so alcohol becomes a friend to us, because for a short while it allows us to escape our misery and insecurity. So we go and see our Doctor who probably prescribes us some form of anti-depressant, yet we continue to feel depressed and all the while our drinking gets worse until it becomes a real problem. And so the cycle of depression and alcoholism starts ... where all we're doing is trying to mask the symptoms without ever getting to the underlying causes. With the irony being that because we no doubt keep drinking while faithfully taking our meds, our medication is rendered totally ineffective and we probably end up feeling worse because of the numerous side-effects drinking while on these anti-depressants and similar medication causes. Alcohol is a depressant - we drink too much for whatever reason (stress, problems at work/home, insecurity) - and soon enough we feel depressed, which is how the cycle starts. The bottom line is that for many of us, alcoholism and depression seem to go together, for a variety of reasons. So how do we treat it? Most experts at Drug and Alcohol Rehabilitation Facilities regard alcoholism and drug addiction as the primary illness - with co-occuring disorders like depression and anxiety as the secondary illnesses. Because by treating the alcoholism or drug addiction as your primary illness – a lot of your associated illnesses like depression will usually resolve themselves because they do work together. And until you have a clear mind, freed from the shackles of regular abuse by things like alcohol or drugs, you won't know whether your depression is still a problem. That's why treating alcoholism and depression independently of each other just doesn't make sense. You should be looking to be treated holistically for all co-occuring disorders because that provides you the best chance for long-term recovery. Almost all Alcoholism Addiction Treatment Facilities and Programs tend to work on that basis today. They treat everything from substance abuse, to depression, to eating disorders. And because they're looking at you holistically, their treatment is more likely to be successful. So with depression and alcoholism – the most important thing to remember is that they are undoubtedly linked and that in most cases by having your alcoholism or drug addiction treated, your depression will be treated at the same time. Why not kill two birds with one stone? A lot of research has been done today on a variety of methods that can alleviate and cure depression. Holistic professional treatment that addresses both the alcoholism and depression should be the first step. But there are a lot of things you can do to support your healing. Adopting a healthy and well-balanced diet, engaging in activities like meditation and yoga, regular excerise, and using natural supplements (always check with your Doctor) like St Johns Wort, 5HTP and others found at your local health shop can make a world of difference. But be warned - doing those things and continuing to drink is not going to make any difference. Not only are those suggestions invaluable in treating most mood and mental disorders, but they'll invariably improve the quality of your life and how you feel about yourself tenfold. I'm a big fan of meditation in particular. Becoming a regular and proficient meditator is one of the biggest gifts you can give yourself. Think of it as learning to train your mind to handle anything that life can throw at you. In fact studies have shown that relapse rates are something like 60% lower for people that meditate than those that don't, a year into their recovery. Powerful! So if you're serious about making changes in your life so that you can start to feel better about yourself, pay attention to the suggestions provided on this page. Be sure to also read this piece on Alcoholism and Anxiety because depression and anxiety often go hand in hand, so it will provide you with further insight and a couple of additional tools in your arsenal. This article on Alcoholism and Psychology also provides an interesting take on the causes of things like depression, alcoholism, and anxiety so be sure to take a look. 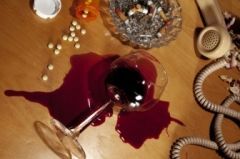 Here is also an Anxiety Alcoholism article guest written for us by Ryan Rivera, owner of the Calm Clinic at calmclinic.com. He provides additional suggestions for overcoming anxiety.